The 5th of December is Krampus-day, celebrated in Bavaria, Austria, Hungary, Slovenia, Croatia, Czech Republic, and North Italy. (In Northern Germany, he is known under the name of Knecht Ruprecht, “Servant Rupert”). 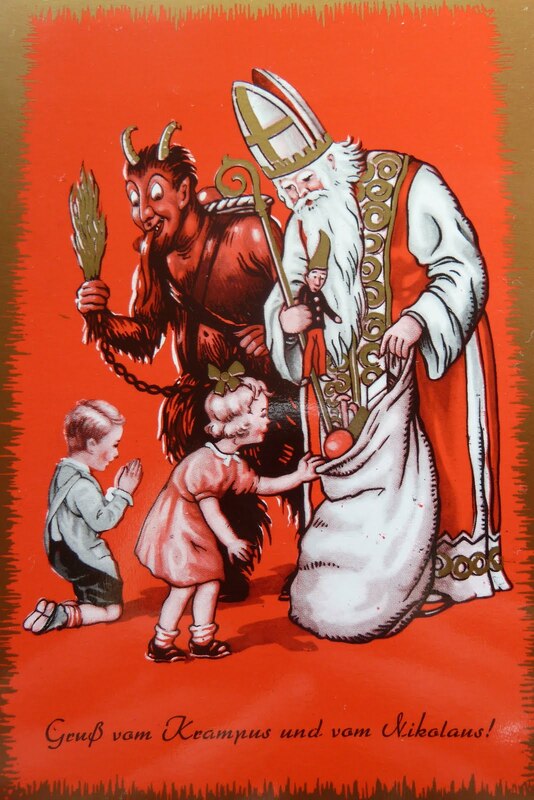 Krampus is the counterpart to St. Nicholas, the bishop who rewards all good children. Instead of bringing sweets and small gifts, Krampus is coming to fetch the disobedient and misbehaving children. He is a terrifying looking demon, dressed in goat-fur, with goat feet, dark hair, horns and a tail, carrying chains and a cow-bell to announce his coming. He is carrying a basket on his back where he is going to put the bad children and take them away with him. It was a common warning for children to behave better if they didn’t want to be taken away by Krampus (even my Grandma said that to me and my brother, although she might not have meant it that seriously). The name comes from either Old German Krampen, which means claw, or from the Bavarian word Krampn, meaning something lifeless or withered. There are different versions of his origin. In Norse mythology, he is said to be the son of Hel. Besides that, his looks resembles that of the Greek-mythology Satyr. In Austria, as well as in the whole alpine area, the custom of Krampus-processions was very popular, until the inquisition forbade under penalty of death to dress up like a devil. However, in some remote areas the custom survived. From the 17th century on, it was common that St. Nicholas and Krampus went from house to house together to reward the good, and punish the bad children. In Austria, although slowly declining, Krampus-day is still celebrated. There are Krampus-processions where people dress up with fur costumes and wood-masks to scare people by ringing bells and swinging whips. While these processions mostly take place at some market place or city center, the house-to-house march is more common in the countryside. I still can vividly remember what Krampus-day was like when I was a child in Styria, Austria. The day began in a tense mood of awaiting, similar to Christmas-Eve, only scarier. Although my brother and I were pretty sure that we’d been good all year, one could never be sure if it was good enough for Krampus. In the evening, we prepared small baskets or shoes that we put in front of the door, in the hope that St. Nicholas would put some peanuts, mandarins and chocolate in it. Then we had to wait. Gathered between our Grandma and Grandpa, my brother and I waited silently for the slightest sound of ringing bells or jangling chains. (Sometimes, my father played jokes on us by rattling a chain in the basement). Eventually, they arrived. St. Nicholas splendidly dressed in his traditional vestments, wearing the mitre and carrying his crozier, and Krampus with his birch, all in black, tall and vicious looking (it didn’t really help to know that he only was one of the older boys from our neighborhood; it was still very scary.) Some years later, my brother and his friends dared each other to go out, provoke the Krampus, and run away without being caught. My brother and I clung even tighter to our Grandparents when St. Nicholas asked us if we’ve been good. We answered “yes”, but to proof this, we had to say a prayer. After that, they both were satisfied and left, but not before filling our baskets with candy. Although this custom came up as a warning for children to behave, and the figure of the Krampus was invented as counterpart to point out the good virtues of St. Nicholas, it lost its original meaning and turned into an evening that is all about dressing up, candy and harmless thrill.